For experts and beginners, these large, 8.25 inch sheets make folding easy for beginners and provide a large format for more complex models. The specialty abstract prints, bright hues and solid color reverse will thrill origami folders with new designs and patterns. 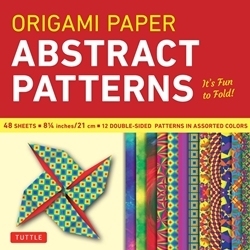 Finally, an origami kit with exciting colors and patterns for beginners and experts alike. The large, 8.25 inch sheets make easy folding for beginners as they follow the included instructions. The specialty prints and solid color reverse on these papers will thrill experts with new designs and patterns for their art. The 48 sheets in this kit feature groovy and mesmerizing designs reminiscent of the 60's. On the reverse of each sheet is a solid, complimentary color. Finishing up the kit are instructions providing an introduction to basic origami folding techniques and instructions for 6 different projects.